The loss of economic activity due to excessive taxation. For example, suppose a person on welfare is offered a job that pays more than he/she receives in welfare benefits. If taxes are too high, however, the person may find that his/her aftertax income is in fact lower than what he/she was receiving on welfare. The person might then rationally decide to stay on welfare. The deadweight loss is both the cost of keeping that person on welfare and the loss incurred from the economy at large from losing that person's production. It is also called the excess burden of taxation. Fig. 36 Deadweight loss . the reduction in CONSUMERS’ SURPLUS and PRODUCERS’ SURPLUS that results when the output of a product is restricted to less than the optimum efficient level that would prevail under PERFECT COMPETITION. Fig. 36 shows the demand and supply curves for a product, and their interaction establishes the equilibrium market price OP. At this price, consumers’ surplus is shown as the diagonally shaded area ABP and producers’ surplus as the vertically shaded area APO. If output is restricted from OQ to OQ1, then the price paid by consumers would rise to OP1 and consumers’ surplus would be reduced by the amount ACE, while the price received by producers would fall to OP2 and producers’ surplus would be reduced by the amount ADE. Deadweight loss is particularly likely to occur in markets dominated by MONOPOLY suppliers who restrict output in order to keep prices high. 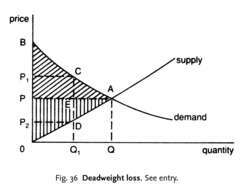 The fee also creates a dead weight loss in the economy, equal to the shaded area a-b-c. This creates a potentially large dead weight loss in the economy, and predicts an increase the share of revenue from players with a gambling disorder. However, the report cautions that public support can only target areas where there is a market failure and would have to avoid wasting public resources and creating dead weight loss. Similar to calculating consumer surplus, dead weight loss can be calculated per consumer group and then summed. Instead, the message concerning price discrimination and economic efficiency should be: Compared with a nondiscriminating firm, when a firm engages in third-degree price discrimination it attem pts to capture more of the potential gains from trade that exist in the market--be this through a transfer of consumer surplus or dead weight loss to the firm's profit. T]), Consumer Surplus (CS), Profits ([pi]), and Dead Weight Loss (DWL) for The Cases of Perfect Competition (PC), Nondiscriminating Firm with Market Power (ND), First-Degree Price Discrimination (PD1), and Third-Degree Price Discrimination (PD3) P [Q. Area E is the social welfare loss, or dead weight loss. The dead weight loss and social welfare loss are the same and are equal to area E, or $12. This last case makes it clear that the objective is NOT to minimize the transaction cost per unit or the total transaction cost or the dead weight loss triangle alone. But part of the dead weight loss still remains, namely the production cost. Steeply rising marginal cost, for example, implies smaller dead weight loss in the pure monopoly situation, all other things constant, than in the constant marginal cost case.